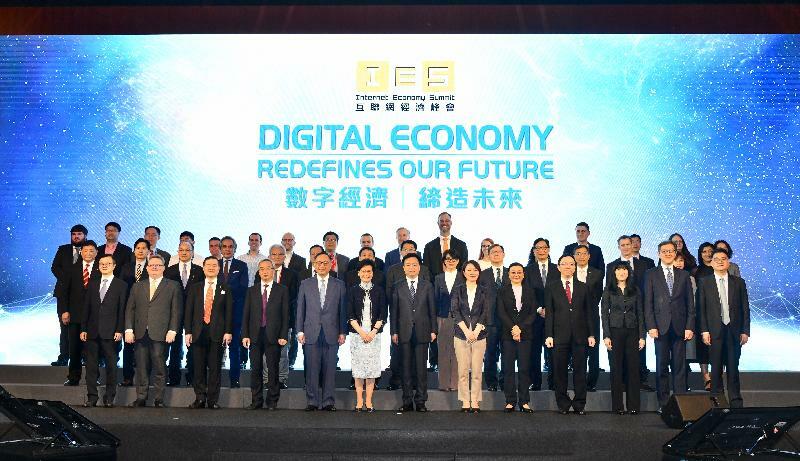 The 4th Internet Economy Summit (IES), themed "Digital Economy Redefines Our Future", opened today (April 15). 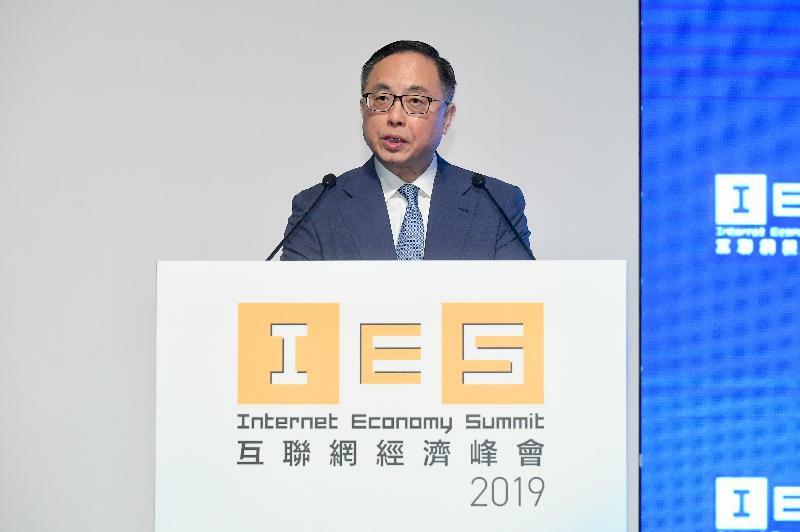 Over 70 renowned experts, industry leaders and government officials from overseas, the Mainland and Hong Kong are gathering at the two-day Summit to share their insights on global technology trends and business adoption in spurring the growth of the Internet economy. An attendance figure of more than 2 000 is expected for the Summit over the two days. 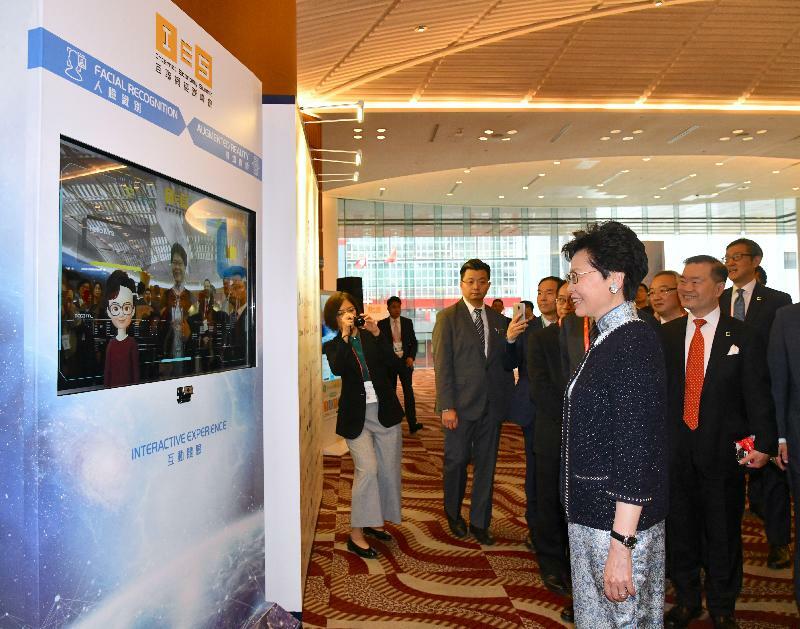 There are six thematic forums this year, focusing on how data will fuel innovations in different technology sectors including FinTech, artificial intelligence (AI), smart manufacturing and cyber security as well as in the development of the Guangdong-Hong Kong-Macao Greater Bay Area. Emphasis is also put on the exchange of strategies and best practices of businesses. 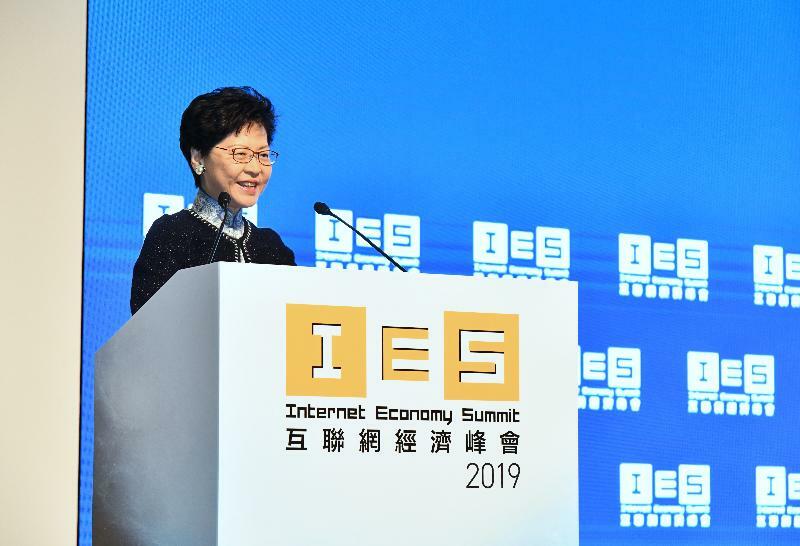 The IES today started with the opening remarks by the Chief Executive, Mrs Carrie Lam. The Secretary for Innovation and Technology, Mr Nicholas W Yang; the Government Chief Information Officer, Mr Victor Lam; Deputy Director of the Cyberspace Administration of China Mr Yang Xiaowei; Deputy Director of the Liaison Office of the Central People's Government in the Hong Kong Special Administrative Region Ms Lu Xinning; the President of the China Internet Development Foundation, Ms Ma Li; and Member of the Standing Committee of the CPC Hangzhou Municipal Committee Mr Chen Xinhua also officiated at the opening ceremony. Today's IES programme featured two thematic forums, the Visionary Forum and the Chambers Forum. At the Visionary Forum, speakers enlightened the audience on the ways businesses and the community can stay ahead and resilient amid the technology disruptions. The General Counsel of Amazon Web Services, Mr Bob Kimball, talked about how cloud service is going to help business bloom, and the President of the Alibaba Global Business Group, Ms Angel Zhao, and the Vice President of Asia Pacific, Twitter, Ms Maya Hari, shared examples of how technology solutions can escalate business value chains to a new level and the power of real-time public conversations in driving economic development and solving tangible real-world problems respectively. The Government is actively taking forward various initiatives to build Hong Kong into a smarter city. Estonia is well known for deploying technology innovations to transform the nation into a digitally integrated and seamlessly connected country. The Global Affairs Director of Government Chief Information Officer Office of the Ministry of Economic Affairs and Communications of Estonia, Ms Sandra Särav, spoke to the audience today on Estonia's experience, especially in leveraging new and emerging technologies to maximise value in government processes. Other keynote speakers at the Visionary Forum included Professor Steven Weber from the UC Berkeley School of Information; the Chief Representative Officer, Greater China and Member of the Executive Committee, World Economic Forum, Mr David Aikman; and the EY Global Artificial Intelligence Leader, Dr Nigel Duffy. The Chambers Forum in the afternoon presented to the participants keynote speeches by representatives from Microsoft and Sino Group. Four panel discussion sessions were also staged, covering the new opportunities brought about by open data; practical tips for small and medium-sized enterprises to enhance logistics agility and operations with new technologies like AI, blockchain and the Internet of Things (IoT); and innovation in the Greater Bay Area. The Summit will continue tomorrow (April 16) with the FinTech Forum, in which the Financial Secretary, Mr Paul Chan, will give opening remarks. Prominent industry experts will dig into areas including virtual banking, InsurTech and blockchain. 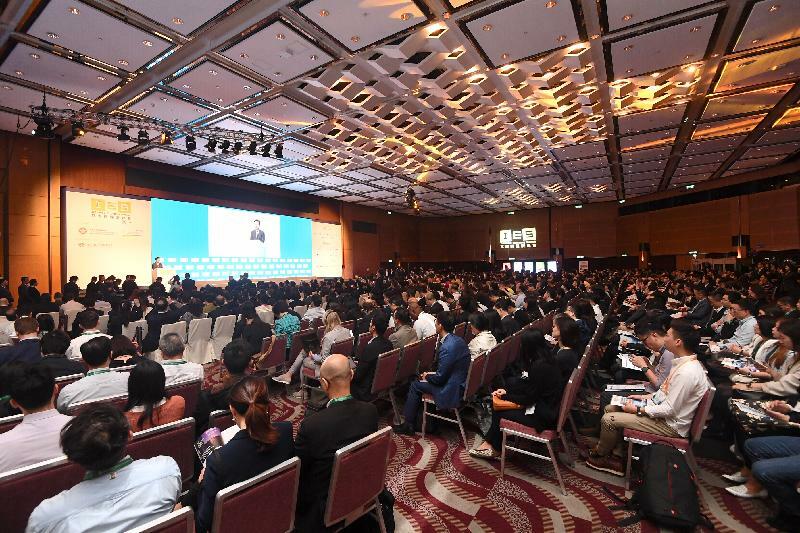 Three parallel sessions, namely the AI Forum, the Enterprise 4.0 Forum and the Cybersecurity Forum, will be held in the afternoon with the Hong Kong Science and Technology Parks Corporation, the Hong Kong Productivity Council and the Hong Kong Applied Science and Technology Research Institute as co-organisers respectively. This special arrangement is to prepare the participants for the new digital era when AI and smart manufacturing become the key technologies to transform enterprises and businesses, and revolutionise the way people live and work. Also, with IoT and data-related technologies widely adopted these days, cyber security is of paramount importance to tackle more frequent and sophisticated attacks. The dedicated forum will help participants gain a better understanding of the cyber security ecosystem and tactics to embrace related challenges. The Summit is not only an event for participants to learn from the heavyweights but also a precious chance for attendees to collaborate. A networking reception was held today. Participants can also join the various investor matching sessions and meet with representatives of venture capital funds tomorrow to look for new funding opportunities. 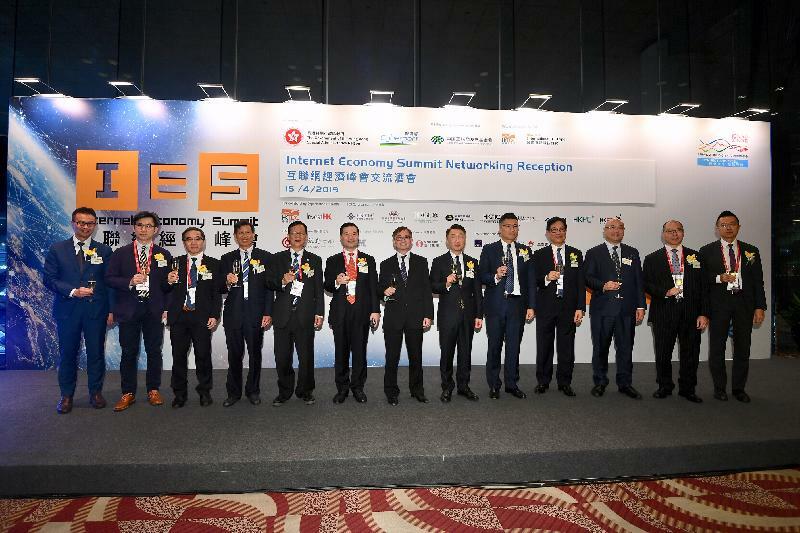 The IES was organised by the Office of the Government Chief Information Officer and the Hong Kong Cyberport Management Company Limited, with the China Internet Development Foundation as the supporting organisation. Details of the Summit are available on the event website www.ieconomysummit.hk.